Playground equipment has seen much evolution since its inception. The first playgrounds were little more than sand boxes; play spaces for many years featured simple devices such as see-saws, carousels and tall swings. Most people remember playing on modular structures of stairs, decks and slides. One newer form of play design, matrix nets, offers a much better play experience for children by creating a constantly moving platform for play that has unlimited play choices and constant sensory feedback which inherently encourages children to be more active. Innovative combinations of both net climbers, the pyramid-shaped and exterior-frame, have become more common in playgrounds these past few decades. Either featuring a matrix framed product, or a free-form, multi-plane net climbers, that could also incorporate swinging, swaying, spinning, and more into adventures, actively removing any form of ‘linear structured’ play. 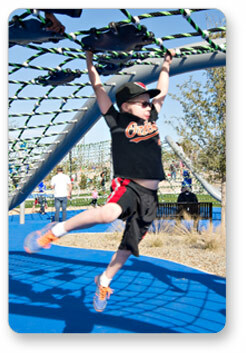 The unique designs of net climbers are increasingly being completed around the globe, and taking the playground industry by storm. Another value these new creations possess, is the accessibility of the play structure allowing users of all abilities to participate in the same play experience. Unfortunately, the most common practice to do this is to acquire the ‘classic standard’ equipment targeted explicitly just for special-needs users. Although providing equipment targeted specifically to special-need users is an admirable step forward, an even better resolution would be to provide equipment that accommodates to everyone at the same time, offering accessibility for any user, according to their own desires and abilities. Play space designers do have a massive responsibility. The ultimate goal of today’s new playground projects is to offer children of all ages a better play experience. The best playgrounds will be very enticing to children, attracting them to go to explore everything there, with a variety of sensations and puzzles that keep children intrigued for long periods of time. Experiencing that amazing feeling will have them craving to return again – making their own decision to leave behind computers or technology to just go out and play. Our playgrounds are unique and cutting edge games, made from modern materials and play equipment designs. Play that allows designers and buyers to make an immense contribution into how our children grow, learn and develop. Let’s give them a better foundation for their future. We can all agree that education is very important, but better Play Matters too.